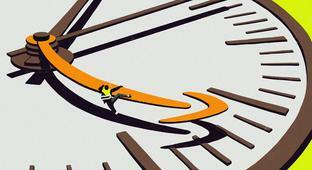 It has made the employees thus snared give up work time whenever it suits their logistical requirements. Which can apparently be quite often. And then they use another wonderful euphemism (much like "fulfilment center"), VTO (or "voluntary" time off) to cache it all in "Newspeak" obfuscation. And heaven help you if you don't "volunteer" to leave before you've had a chance to get a full day's worth of pay in; the restitution you need in order to make getting to the "fulfilment" center worth the cost of travel time in the first place; which is a considerable labor expense for marginal pay workers. In order to get the full irony of this, though, you need to see it in the proper perspective. And you need only look to the city of Seattle to find this perspective. 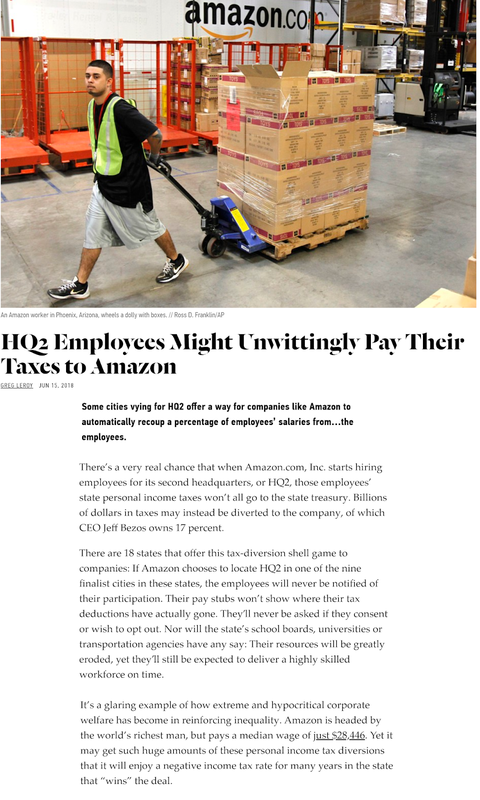 Workers there were made to be pitted against each other by the prospect of Bezos threatening to withdraw jobs because of a measly $20+ million a year employee head tax for the company. Chump change if ever there was such for a company now worth something like three quarters of a trillion dollars. Workers who obviously need jobs desperately. Which is the real point here. Keep the workers needing the jobs desperately. That way, even when the place to do the work has been pimped into your city by whatever giveaways demanded by the company up front for this right (which of course keeps the cities just as desperate for the jobs because of diminishing paths to functional revenue), the actual number of people who will get to work at any one time will likely be quite less, as a matter of operational design. And even worse, it will be these people, made desperate to have work in the first place, who will have to foot the "save the company slack time" costs, being forced to go home before a full days pay, such as it is anyway, is achieved. Nice trick huh? And to top it off Bezos has the gaul to think that everyone should be thankful for this largess that he so beneficently bestos upon the "little people." Just another aspect now of "Business As Usual." And you are the one who lets this situation continue. 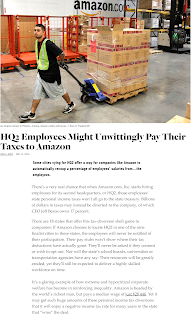 To reduce overhead but continue to sop up performance-based incentives from the local governments it operates in, Amazon has become increasingly reliant on a work scheduling scheme that often coerces workers into leaving their shifts early or turns them away at the door without notice. 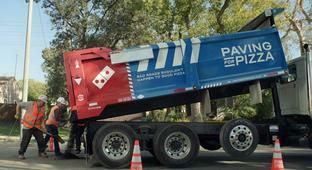 Should basic maintenance of public roads be handed off to corporations for marketing stunts?